The last few years have been quite a bash for biotech. 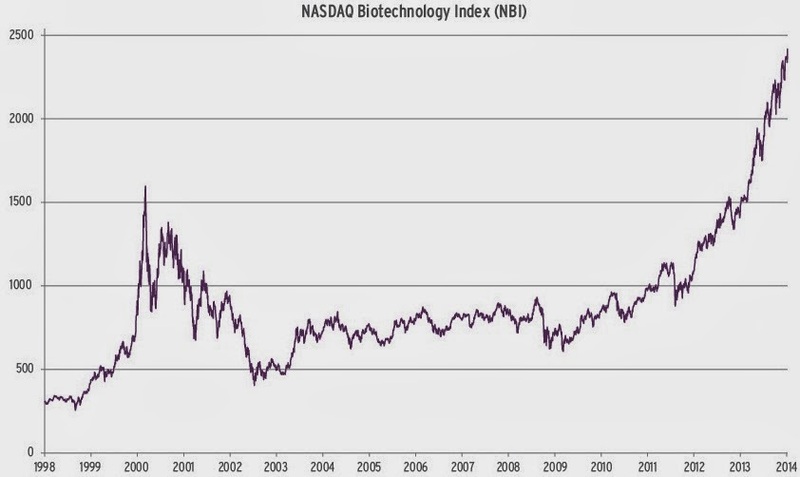 Astoundingly, the NASDAQ Biotechnology Index (NBI) has added more now than it did during the genomics bubble. Since the current biotech rally started around August 2011, the NBI has increased about 1,500 points. Around the turn-of-the-millennium, the NBI rose around 1,200 points in a year and a half. Then over the following roughly two years, the NBI proceeded to give back all but about 200 points of that gain by mid-2002. That makes the ongoing, almost two-and-a-half year upswing the longest, highest biotech rally to date. Going into the 32nd Annual J.P. Morgan Healthcare Conference, optimism in the sector is continuing unabated. The NBI is up over 5% already this year, by market close on Jan. 10. That doesn’t even include the phenomenal, two-day 516% climb for Intercept Pharmaceuticals after its Data Safety Monitoring Board recommended stopping early for efficacy at an interim analysis of a Phase II trial of its obeticholic acid to treat the liver disease nonalcoholic steatohepatitis. Intercept isn’t an NBI component. In one week, the biotech has leapt from mid-cap into large-cap territory; it now has a market cap of $8.6 billion, up from $1.4 billion ahead of the news. On the news front at JPM, Wall Street expects Celgene and Acorda will pre-announce 2014 guidance at JPM. Celgene has hinted it may also update its long-term guidance for 2015 and 2017. Exceeding even the very early JPM curve, Eli Lilly and Bristol-Myers Squibb have already pre-announced their 2014 guidance. Other likely highlights include various details from big biopharmas with recent management changes. We could get hints from Teva about the direction it plans under newly appointed President and CEO Erez Vigodman, as well as some color from Amgen on why CFO Jonathan Peacock is departing. The above should give you a few talking points, as will the deals discussed below. That’s essential when you run into industry colleagues you are just meeting or seeing for the first time in years. A list of all the JPM parties is also indispensable. Last year was the first time we saw a spreadsheet of all these events. Despite the fact that the Excel document ran a couple of pages, shockingly there were still a few omissions discovered by us and a hedge fund manager who shall remain anonymous. One of this year’s versions of the JPM party list, linked to above, has been upgraded to a PDF and carefully annotated to note invitation-only parties. Although we wonder, isn’t this list specifically designed for party crashers? Or, maybe it’s just so we’ll know all the fabulous parties we weren’t invited to? The most prosperous entities at any given time always seem to commandeer the penthouse at the pricey Clift Hotel, but of course no spot is cheap at the height of the conference. Another JPM must is a lot of hand-washing – someone at the last JPM gave DOTW a horrible case of the stomach flu that felled us by Wednesday afternoon. Not to alarm anyone, but the number of flu cases in the U.S. is peaking right now, with a heavy concentration in the Western states. And a San Jose hospital reportedly set up an over-flow tent because of all the flu patients. So, avoid shaking hands with all those Silicon Valley VCs, unless you really need their money. And for the ladies: no high heels, please. Unless you’re a former model trained to stand the fourteen hours of pain or you are powerful enough to have a suite where everyone is coming to you. Although JPM has promised it’s working to cut back on some (non-paying) attendees this year, so perhaps there will be ample seating at every major session and the hallway traffic will flow freely. Or not. Most importantly, remember to 'slip' at least once and call the conference H&Q. So, everyone will know you’ve been coming to the conference for a long, long time. As promised, we continue below to give you ample party-chatter fodder with the latest on biopharma wheeling and dealing in this week’s missive of . . .